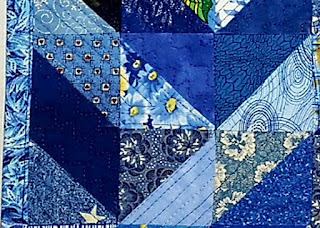 Today is the reveal of quilts for the Four-in-Art Quilt challenge. This is the last of 4 quilts for 2016. Our theme this year was COLOR. 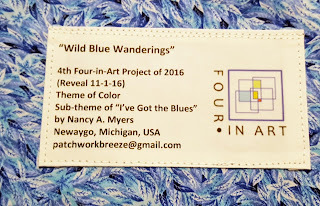 The sub-theme for this last quarter challenge was "I've got the blues." Each of us interprets the theme/sub-themes in our own way. Be sure to visit the other members of the group as they show their quilts. Four-in-Art Quilts, where you can find us all. I thought to play on the word "I've", thinking I could substitute the word "EYE've." 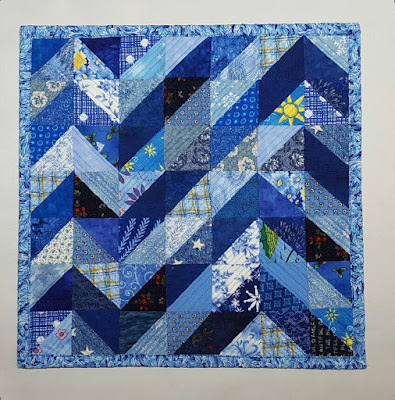 I have blue eyes and was going to use only 2 pieces of blue in the quilt. I thought of about the many blue fabrics I have in my stash. I like blue. I would use many of those scraps. That quilt would have been extremely large. 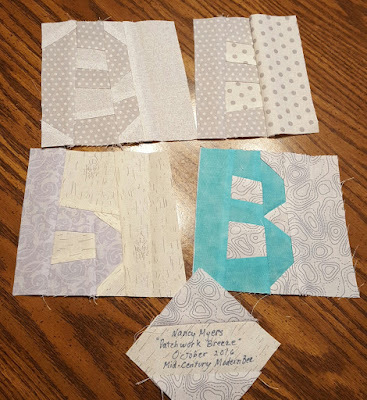 I decided on a smaller quilt. I cut triangles with the Accuquilt that would finish as 2" squares. "I've got the blues" is true for me. Since I didn't know which direction to go with this challenge, I made some pathways. Some of them turn off and go nowhere others go off the edge. Here is a dark, short path that ends by a blue flowered triangle. I used matchstick quilting along the light blue paths with variegated thread. The dark fabric paths use dark blue thread in a wiggly stitch. The quilt measures 14" square. I put triangle corner tabs on the back in order to hang the quilt with a dowel. Here is my reveal. The sun is even shining in one area! Maybe shedding some light on this challenge. Also, just wanted to post the paper pieced letter blocks I made this last month and sent off to the Queen Bee of the Mid-Century Modern Bee. November I am Queen Bee and I have trees in mind. Love your pathways and the fact that they end in flowers! That seems very positive :-) The sun peaking out over the trail is a lovely touch. Amazing that blue eyes inspired so many of the group this time! I love your piece and its pathways. And the sun, well, it always seems to lead us out of "the blues". Great job! Beautiful quilt! I chose this theme because I just love blue. Absolutely my favorite color, in all its variations. This is a fun quilt! Fabulous pathways in that terrific quilt. I love the ideas that you think about and make up in fabric, as you always make such rich connections between the beginning and the final piece. This is no exception--well done! I bet that was nice to use the Accuquilt to cut your fabric! I like your interpretation of having the blues. Not all blue things necessarily are sad. Fun idea with your pathways. How fun is this! 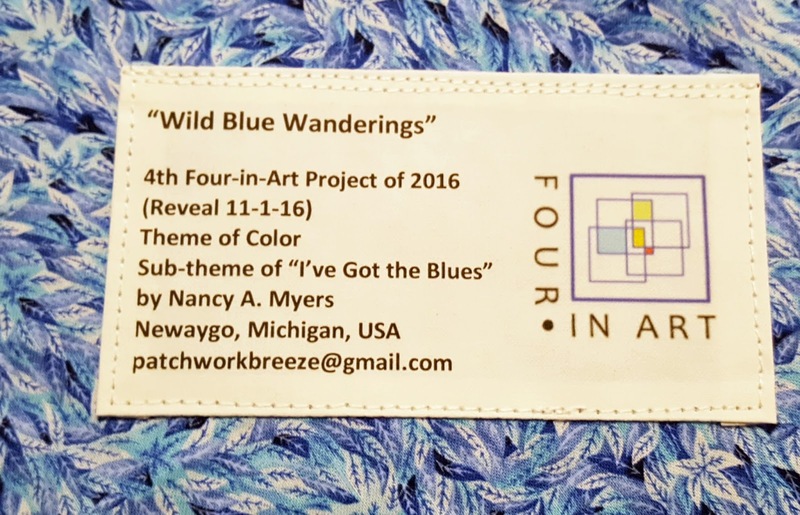 The meandering path of blue- very pretty! I like abstraction, so at first glance, liked your design. Then I enjoyed your description, and saw more than I'd seen at first. Love the bits of sun. Join me on Tuesdays to see what I have resurrected along with others.